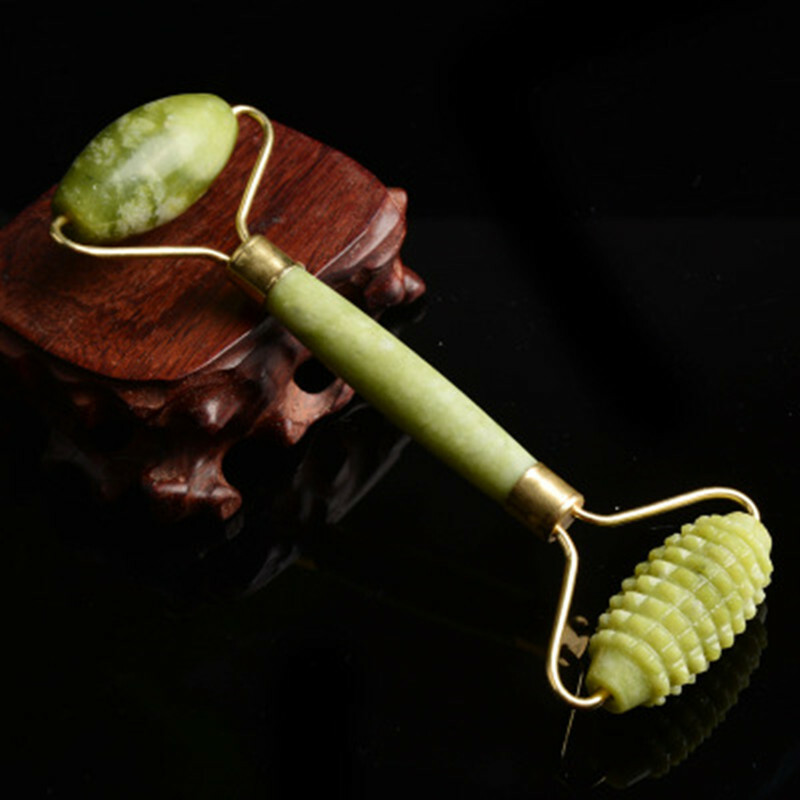 Item: Face Roller Massager Material:Jade Color: As the picture There is an old story saying that, thousands of years ago, the Empress of China used a roller made of jade to maintain her youthful appearance and radiance. The semi-precious stone, considered a symbol of beauty, grace and longevity has long been revered in the east for its mystical powers. Honestly, we can\'t change our age, but we can definitely change the way of our look with different ways. Develop healthy lifestyle and using some beauty tools, like Jade roller.Jade remains cool to the touch (even in warm weather) and can help provide anti-aging benefits. Jade Roller Anti Aging Benefits 1. Relieves facial tension 2. Enhances skin elasticity tightening and toning the skin 3. Discourages the appearance of fine lines and wrinkles 4. Reduces puffiness, eye bags and dark circles around eyes 5. Helps penetrate beauty products like face creams and serums deeper into the skin for better absorption 6. Promotes blood circulation to the face for a natural healthy glow How to use 1. Wash face with normal cleansing products. 2. Apply any night creams to your face and neck. 3. Use upward motions to move the Jade roller gently over your forehead,cheeks,around the lip area and neck. Close your eyes and roll gently over your eyelids if you have puffy eyes or bags under your eyes. 4. Use the roller on your face and neck for 5 to 10 minutes. 5. Use the Jade roller three times a week to reduce lines and wrinkles. 6. Clean your Jade roller according to the instructions. Special Tips: 1. Each one are not the same in color, jade pattern, thickness, it is normal. As this item are carved processed by natural stone. 2. As you know the jade facial roller is fragile, easy to be damage in transit, though we pack it very carefully. If you receive the broken roll massager, please contact us for help!